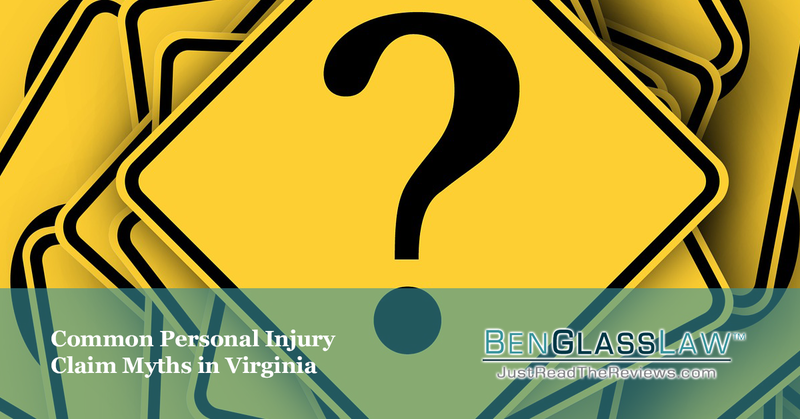 Don't believe everything you hear about Virginia personal injury claims. Even if it seems to come from a credible source, there are a lot of myths floating around out there that can give you false impressions about the world of personal injury lawsuits and cases. Your best source of advice regarding Virginia personal injury claims is a trustworthy Fairfax personal injury attorney. Myth #1 - insurance companies are deeply concerned for your losses and want to help you get all the money you deserve for your accident. This is probably the furthest thing from the truth. As a Fairfax personal injury attorney, I've seen numerous cases that are resolved without professional help, and they often end up being grossly undercompensated. The truth is, insurance companies are in it for the money. They're a business just like any other and their first priority is to keep the money in THEIR pockets. Therefore, they're going to first try to reject your claim right out, and then if they can't, they'll nickel and dime your settlement offer to try and get you to agree to the lowest possible amount. Myth #2 - you're required to give the insurance company a recorded statement or they won't settle. If you're being asked for a recorded statement for your Virginia personal injury claim, DON'T DO IT - at least not until you speak with a Fairfax personal injury attorney. I've seen many a case ruined by victims giving recorded statements where the claims adjuster gets them to make damaging statements. Things you say in the statement such as "Well, I may have stopped short when he hit me" can come back to haunt you, especially in Virginia where we follow contributory negligence laws. Myth #3 - the at-fault party's insurance company is obligated to pay your medical bills as they come due. The insurance company doesn't care when your bills are due. They're already reluctant to pay you anything for your bills, let alone in a timely manner. When you're facing an insurance company that's dragging its feet on a settlement, you may need a Fairfax personal injury attorney to help get things moving. A Virginia personal injury claim doesn't have to end with the word of an insurance company. If you're rightfully owed damages and the insurance company just won't pay, you can always attempt to file a lawsuit.